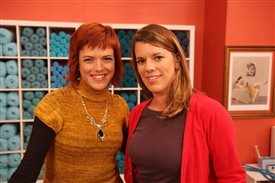 How-To: On the first segment of the show, host Vickie Howell introduces Laura Zander of Jimmy Beans Wool, who talks about her book, Knit Red. Download the pattern for the Snowboarder Hat, by Olympic snowboarder Lindsey Jacobellis, featured in this episode. Vickie is wearing the Crinoline Tee, by Andrea Babb, from Interweave Knits Fall 2013. Sponsored by Jimmy Beans Wool. Space to Space: Travel virtually to the studio of Mary Colucci, executive director of both the Craft Yarn Council of America and the Warm Up America! Foundation. How-To: Next, Julia Madill from Spinrite explains the technique used to make mitered Granny Squares. Download the pattern for the Puzzle Blocks Baby Blanket, as seen on this episode! Julia is wearing Patons’ Slash Sleeve Sweater. Sponsored by Yarnspirations. Tools of the Trade: Learn about ideal products for charity knitting with Tanis Gray. On this episode Tanis talks about Simply Soft Yarn from Caron, Denise Interchangeable Needles and stitch markers from A Needle Runs Through It.